Xiphoid process, cartilages of 5th, 6th, and 7th ribs - pubic crest. 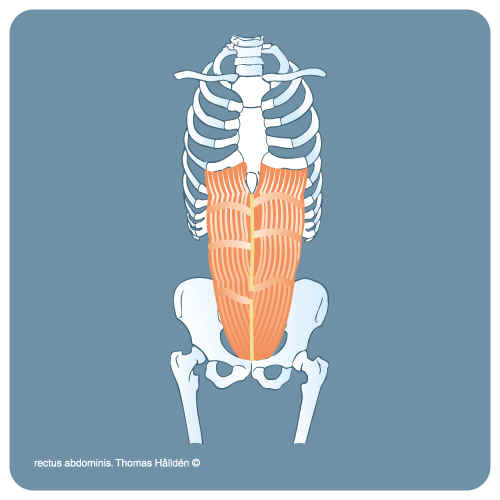 Primary function: Flexes lumbar vertebrae (back bone). Holds up the front part of the pelvis. Flat, divided in intersectiones tendineae @ 3 - 5 pair. Branches of lower thoracic 7 -12 and lumbar plexus L 1. = requires contact with Doctor. Short sit-ups (knees bent). Walking and running.